THE January 17 earthquake near Kobe in western Japan exacted a grim toll: over 5,000 dead -- and climbing -- and more than 23,600 injured, about 280,000 homeless; heavy infrastructural damage like collapsed highways, railroads and buildings. Epicentred 20 km below the tiny island of Awajishima in the Seto inland sea, the earthquake's devastating impact was felt in the Hyogo and Osaka prefectures, too. However, it is Kobe, a major port city of about 1.5 million, that has captured media attention worldwide -- not only for the largescale destruction in its precincts but for the lessons it holds for future earthquake management worldwide. As Japan slowly recovers from this brutal natural onslaught, it is being charged that its much-flaunted technological precautions -- quake-resistant structures and extensive monitoring systems, and other zippy gizmos -- may have been vastly overrated. "We now have to admit that we have structures weak enough to be damaged by a moderate earthquake if it occurs directly below an urban area," says Tsuneo Katayama, professor of earthquake disaster mitigation engineering at Tokyo University. Shattering lessons It is also bitter pie for Japan to learn that the US $100 million it pours into earthquake prediction every year may not have been that productive after all. According to Robert Geller, an American teaching geophysics at Tokyo University, Japan has splurged over US $1 billion since 1965 on a "rather unscientific" earthquake prediction programme. The notorious inexactitude of short-term predictions is widely acknowledged even by Japanese scientists, although not publicly. In Geller's view, the secrecy was largely because of apprehensions that funds might be withdrawn for a network of about 200 seismographs, mostly concentrated near highly vulnerable Tokyo city. 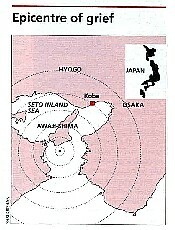 The earthquake followed soon after Japanese scientists offered a wide spectrum of predictions. A week prior to the calamity, Kazuo Mino of Ritsumeikan University in Kyoto warned that a tectonic fault stretching along the western coast had built up "enough energy to cause a very powerful earthquake". He also predicted that in the coming century, a series of earthquakes registering more than 7 on the Richter scale would hit the region. Other experts said Hokkaido in the north was the more likely locale for the next big jolt. Megumi Mizoe, head of the earthquake research institute at Tokyo University, prefers to take a more cautious approach. Mizoe echoes expert seismological opinion saying that it is very difficult to arrive at accurate predictions. Tremors worldwide The aftershocks of the Kobe quake are being felt, metaphorically at least, in many parts of the world. At the Indian Meteorological Department in New Delhi, V P Kamble, additional director general meteorology, affirms that "predictions can never be accurate unless they describe the space, time and magnitude of an earthquake". This is a virtual impossibility, he believes, because of complex fault mechanisms. This mid-January catastrophe is also a powerful reminder to Japan that it skirts the dramatically-named "Pacific ring of fire" -- named because of the earthquake-prone Pacific belt dotted with itching volcanoes. The major worry for the experts now is that "the big one" could next strike Tokyo, or the central Japanese coast, at any time. The Kobe earthquake was the most devastating in 71 years since the Great Kanto earthquake which rocked Tokyo in 1923, killing 140,000 people. If the quake destroyed wealth equivalent to 1/3rd of the nation's annual gross domestic product then, today it is estimated that a similar quake could cause up to us $1.8 trillion worth of property damage. While the science of earthquake prediction is still in the realm of the esoteric, observers are confident about Japan's ability to recover from the mishap. Once the initial chaos settles, Japan's remarkable social cohesiveness should enable it to hop back to normalcy. It should also restructure its earthquake management programmes -- this time with enough sturdiness and scientific pragmatism.